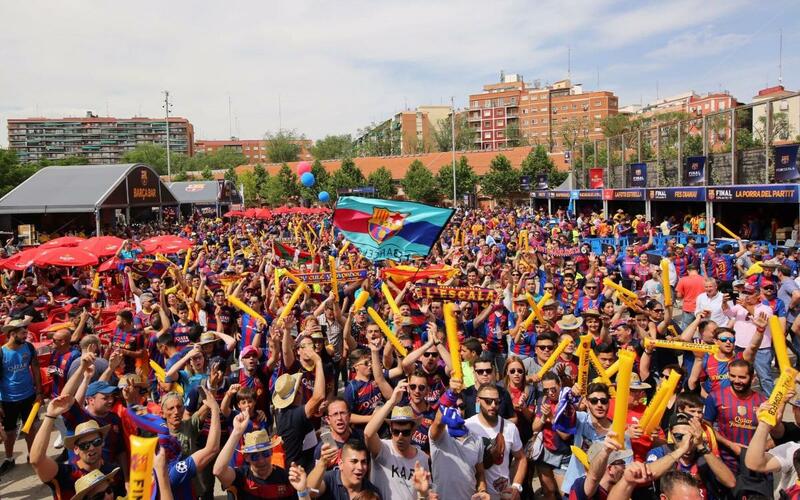 More than 19,000 Barça fans have travelled to Madrid for today’s Copa del Rey Final against Alavés at the Vicente Calderón, flooding the city’s streets with the blaugrana colours, and most especially the Fan Zone in the city centre, which was open from 11.00am, when vice-president Jordi Cardoner was there in person to do the duties. There’s been music, a show by world champion freestyler Jose Ferreras and all kinds of fun and games for young and old alike, with the 8,000 supporters sharing their favourite pics using the #CopaFCB hashtag on social networks – with a first team shirt on offer to the best. There has also been a sweepstake to predict the result of tonight’s game and win the official commemorative shirt, and users of the hashtag #lafotoestrella are posting their top snaps in the hope of winning tickets to the Joan Gamper Trophy. With food, beverages and all the most popular club chants being chorused all day long, there truly was no better place for travelling supporters to get in the mood for kick off!